The Linear Homogeneous Production Function implies that fall the factors of’production are increased in slime proportion. the output also increases in the same proportion. That is. the doubling of all inputs will double the output and trebling them will result in the trebling of the output, aim so on. This represents a case of constant returns to scale. This type of production function is called by the economists as a well behaved production function because it can be easily handled and used in empirical studies. It can he used by computers in calculations. That is why it is widely used in linear programming and input-output analysis . 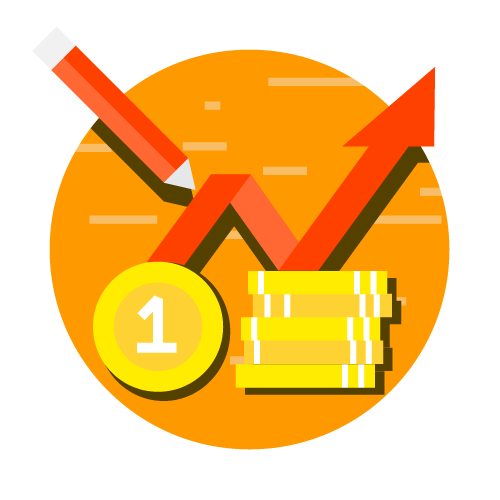 It is extensively used in model analysis of production. 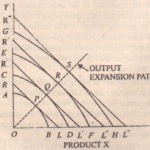 distribution and economic growth. This is a production function which is homogeneous of the first degree. 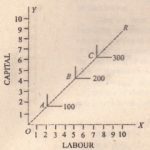 That is, it shows that the increase in output in the same proportion follows a given change in the factors of production. This has been put mathematically as. This fun is homogeneous of Kth degree. If K is equal to one then this homogeneous fun is homogeneous the first degree and if l( is equal to two it is homogeneous of the second degree, and so on. If (( is greater than one the production function gives increasing returns to scale and if it is less than one it gives decreasing returns to scale. 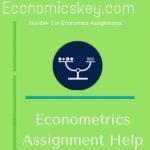 In the case of homo- -igneous production function, the expansion path is always a straight line through the means that in the case of homogeneous production function of the first degree. given constant relative factor prices. the proportions between the factors used will always be the Whatever the level of output. This makes the task of the entrepreneur easy . Having hit on an optimum factor proportions, he need not change the decision so long as the relative prices the factors remain unchanged.